You spend too much time and money on your landscaping and garden to have it destroyed by moles, mole hills, mole tunnels, let our Mole Removal service help. We trap moles, we get rid of moles for you, and we remove moles off of your property so you can go back to enjoying your beautiful lawn, flower beds or garden. Moles are small subterranean mammals that typically spend their entire life underground. They have tiny or invisible eyes and ears as they are relatively unnecessary for their underground lifestyle. 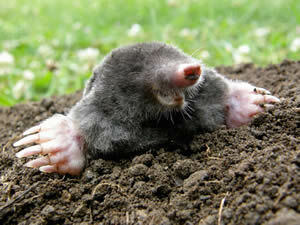 Moles have large oversized forehands that are specifically designed for digging. Moles can be found across North America and are a common pest problem. Moles primarily consume earth worms and grubs in the soil along with any other underground invertebrates and occasionally various types of nuts. Moles contain a toxin in their saliva which helps paralyze their prey once they capture it. This diet makes manicured lawns and landscapes a large target for mole activity. Well watered lawns and loose moist soils of flowerbeds are a hotspot for worm and grub activity. This abundance of food sources will continually attract moles to your property. Moles create elaborate underground tunnel systems which are not only highways for moles but also serve as feeding tunnels to collect worms and grubs. These underground tunnels are an eyesore throughout your lawn and flowerbeds and commonly travel under concrete driveways, sidewalks, and foundations which can undermine these structures and even create future washouts from erosion. Moles do not feed on vegetation but their excessive digging can commonly damage the roots of grass, flowers, and shrubs. Moles will continue to reproduce and if left uncontrolled and the problem will continue to escalate. If your lawn is under attack from moles, Trapper J can provide the mole removal service that you need to protect your property. We can provide intensive mole trapping to eliminate the current population followed by ongoing mole control programs that will continually control future mole invasions and protect your landscaping from their persistent damaging effects. Trapper J, a North Louisiana Mole Removal specialist is the most professional and humane Mole removal service available in Monroe, West Monroe, Ruston, Bastrop, Alexandria, and Pineville in the North and Central Louisiana area.